Hi again! We are back with a bonus mid-week post to give some more tips on drawing for your charts that will help every child in your classroom achieve independence in learning. We have also noticed quite a few new visitors, so before we get to the drawing bits, we would like to take a moment to reintroduce ourselves. 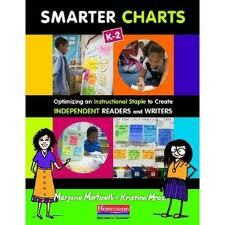 Chartchums is made up of Marjorie Martinelli and Kristine (Kristi) Mraz. Marjorie Martinelli is currently a literacy consultant at the Teachers College Reading and Writing Project, which works in schools across New York City, the country, and the world. Marjorie is also an artist and was formerly a New York City public school teacher. Kristine (Kristi) Mraz is a current kindergarten teacher at PS 59 in Manhattan. She was a literacy consultant with the Teachers College Reading and Writing Project before returning to the classroom. Kristi is a crafter, which means she has a lot of yarn taking over her apartment. Together we have written a book called Smarter Charts about building independence through effective charts (available now-click on the picture at the right!). We also consult in schools, present at conferences, and lead workshops, all on charting, independence and accountability. One aspect we ALWAYS cover is drawing, (no matter what!) because drawing is a quick way to bring our words and concepts to life. Our new book has lots more on the importance of visuals and their role in memory, but for this post we want to cover one more quick and easy art lesson: figures! 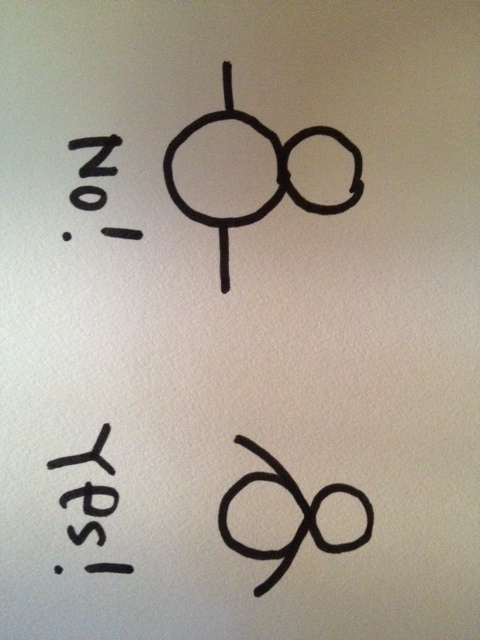 Call it a bias, but we don’t do stick figures. 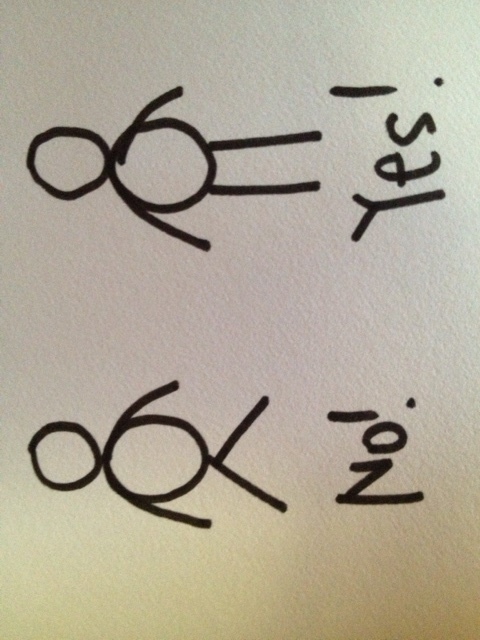 There is nothing inherently wrong with a stick figure, but more well rounded figures (pun intended) are more expressive, easier to manipulate, and more like what children do naturally and thus able to do independently. Even if you never explicitly teach drawing (through we think you should!) 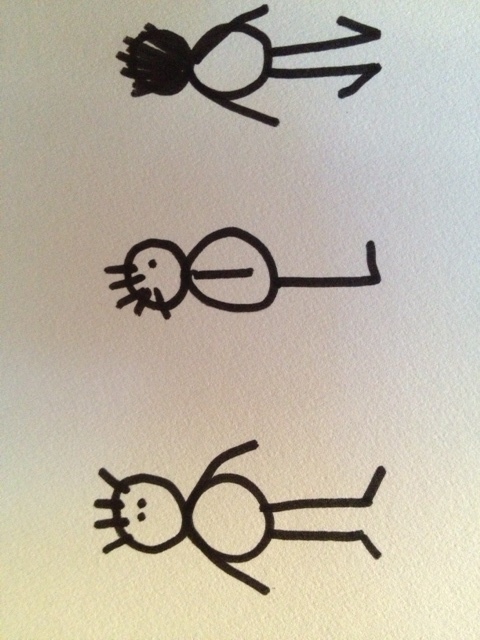 children will learn from watching you make these simple figure drawings capture complex acts. Can you draw an O shape? Yes? Great. Make a few quickly. Can you draw a stick? Yes? Perfect! You now know EVERYTHING you need to draw people. 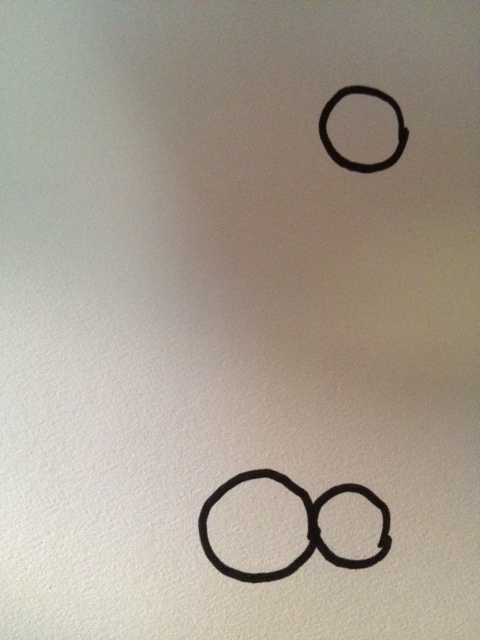 Draw one O on top of another O so it looks like an 8. Don’t worry about a neck, simple is better. Lots of times arms are drawn sticking straight out of the ribcage (as shown on left). Look at your own body, wave your arms around and you will see that your arms really come out at the very top of your body (as shown on right), which is good because otherwise you could never scratch your head. Again, this is a place to slow down and study your body again. 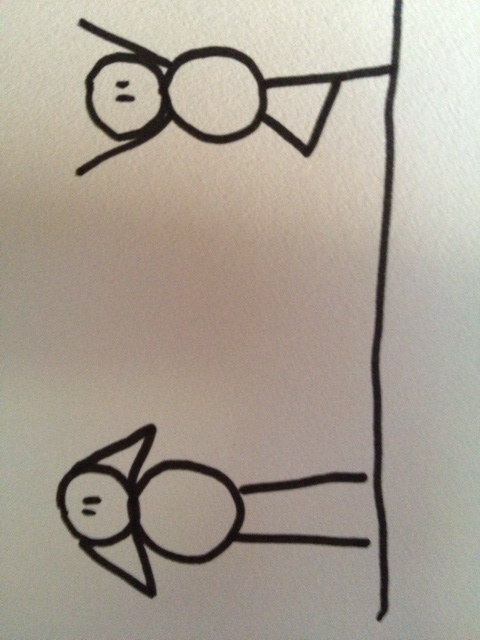 If you have a history of drawing stick figures, you will likely draw legs like the figure on the left. Be kinder to yourself, your legs do not shoot out at funny angles from the middle of your body. Instead they come straight down at about the width of your head (see the figure on the right). That is pretty much it! If/when you teach this to your students, it is helpful to do lots of studying of bodies to really see how arms and legs fit together. It is also a great opportunity to build language and vocabulary, not just of body parts, but words like: above, below, longer, shorter, and so on. Once you have the basic figure, you can bend the arms and legs to show basic movements. On the left is Kristine trying to find the adult scissors she knows she put somewhere under the pile of math manipulatives that still need to be sorted. On the right is Marjorie enjoying a little time off to practice tree pose (before she is back in the hustle and bustle). Add feet at an obtuse angle (larger than 90 degrees) on your forward facing figure (on far left). To turn a figure sideways, start with the same double O body shape, but only add one arm and one leg, both in the middle. Add one eye and a foot facing the direction the figure is looking and the body is now in profile (in middle). Last, draw the same exact body, arms, and legs as the front facing figure. 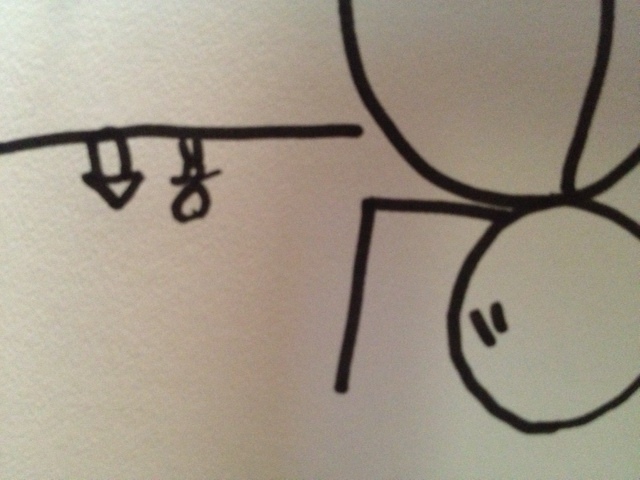 Now, draw the feet at an acute angle (less than 90 degrees) and color in some hair. You are now looking at the back of the figure (far right). Voila! Usually the near figures will take up most of the frame, and extend above the horizon line. We will be back again soon with another new post. In our upcoming installments we will be tackling charts at the beginning of the year, charts across grades, adaptive charts for students with special needs, and more! Like our book? Leave a review on amazon.com and tell the world!